Many congratulations to Ross Birkett successful at Epsom today for Lady Herries aboard BARWICK in the Investec Gentlemen’s Derby. With torrential rain setting in for the afternoon and a dramatic change in ground to officially heavy, there were 3 non-runners from the original line up of 10. Will Pettis made much of the running on Glennten who got swallowed up when entering the straight, but his front running tactics played into the hands of the winning combination with Ross holding up Barwick for much of the race at the rear of the field. Ross progressed through the field to lead 2 furlongs out and headed for the stands rail once he hit the front, maintaining his lead to win easily by 10 lengths. Well done to winning connections. 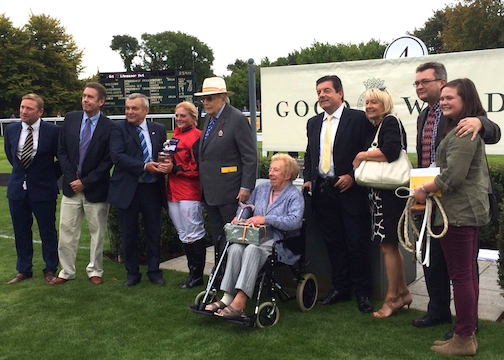 By kind invitation of His Grace the Duke of Richmond, Goodwood hosted an amateur race today in memory of Gay Kindersley. 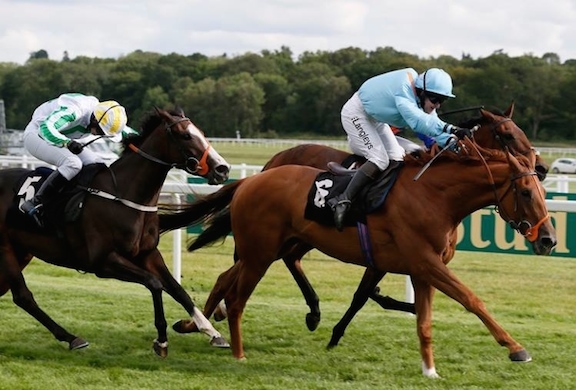 Originally the Richmond-Brissac Trophy and a Fegentri race in recent years, it was good to see 10 horses go to post for a race which remains special in our calendar and no longer has unusual race conditions. An early fast pace was set with the ultimate winner, VICTOR’S BET, slowly into his stride and virtually tailed off after only 2 furlongs, yet ridden with supreme coolness by Ella Smith whilst held up at the rear of the field. Ultimately his jockey delivered him perfectly in a thrilling dramatic finish with little more than hands and heels to sweep into the lead and win by 1 3/4 lengths from Ross Birkett on AUTOMOTIVE, with Michael Murphy and Brodie Hampson only a short head and a head back in 3rd and 4th respectively. Trainer Jack Smith said “He’s not a bad buy for £500 from Ascot. I knew him in Spain when he was owned by Victor Chandler, who brought him back after Mijas closed. He had won in Madrid and bad horses don’t win there. He has shown his Newbury win was no fluke and Ella has given him a brilliant ride today, after they went off too fast.” Many congratulations to winning connections. 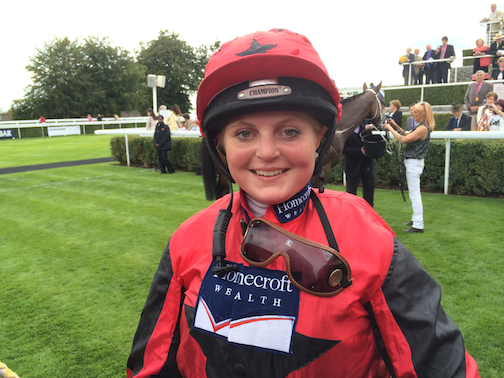 Congratulations to leading lady jockey Serena Brotherton who took her tally for the season to equal her best ever 2011 total of 9 today when winning the Betfred Ladies Derby at Newbury. 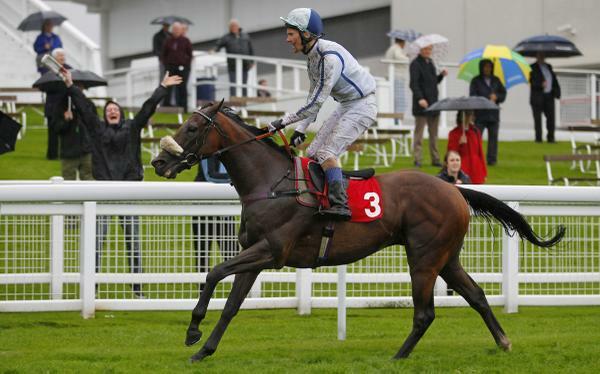 This was Serena’s 4th win of this race since its inception 7 years ago, and her first ride for Richard Hannon. A thrilling three-way battle to the line saw Serena ride a strong finish and lift LIL ROCKERFELLER to the winning post a neck in front of Megan Nicholls aboard her father’s AMANTO with Irish leading lady Jane Mangan half a length back in third for Sylvester Kirk on LAST MINUTE LISA. 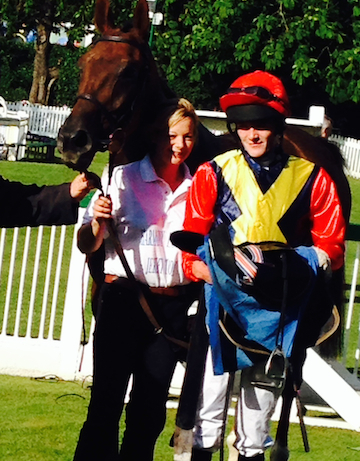 Marcus Haddock enjoys winner with first ever ride! 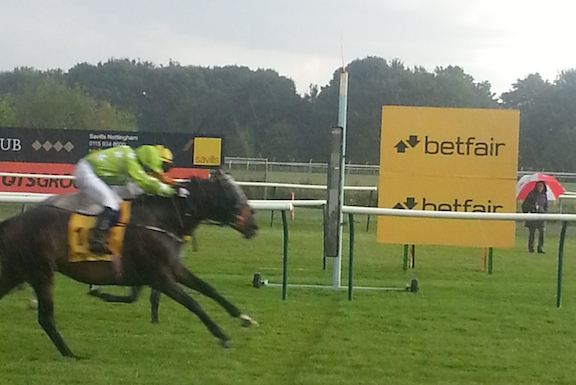 The 6th race in the Betfair Novice Riders Series at Nottingham saw 4 non-runners of the original 11 declared with monsoon conditions giving concern for a slippery surface after heavy rain falling on hard ground. After listening to expert guidance from Jockey Coach Jimmy Bleasdale on the pre-race coursewalk, jockeys set off at a steady pace and did not quicken until turning into the straight where they formed a line abreast. A battle to the line ultimately ensued between Jordan Williams on TASTE THE WINE and first time jockey Marcus Haddock on SOUNDBYTE who led near the finish to hold on by a head. 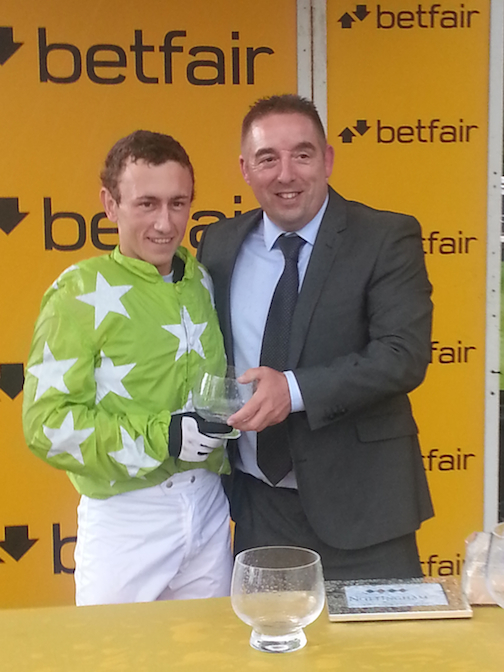 Many congratulations to Marcus, a graduate of the Northern Racing College, seen here receiving his prize from Betfair’s Simon Kirk. The series now moves on to the penultimate race on Bank Holiday Monday at Ripon. A cool head and a patient ride were demonstrated at Catterick tonight when Alex Ferguson‘s waiting tactics with trainer Saeed bin Suroor’s ARABIAN BEAUTY were used to good effect in the familiar Godolphin colours. Having won here three times already (including both last year and this in the Betfair Series), Alex is becoming something of a course specialist. Holding the filly up in the rear, Alex still had most of the field in front of him 2 furlongs from home but when he asked her to quicken she stayed on strongly to get up inside the final furlong and won by just over a length, going away. This was Alex’s 4th win on the course from 5 rides, and his 6th win overall. Congratulations Alex! 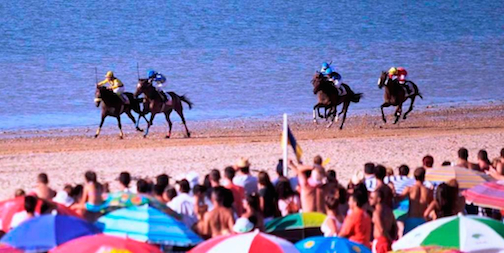 The final 2 races in the Arabian Ladies Series take place in August, in Ostend Belgium on 18th where Rachel Leyshon from Wales will represent Great Britain and on 24th August in Sluzeiwic Poland where Katie Margarson from Newmarket will ride. This extraordinary worldwide series has already taken British lady riders so far this year to Al Flaij, Oman (Berkshire’s Michelle Edden), Melbourne, Australia (Yorkshire lass Aly Deniel WON), St Moritz Switzerland (only professionals and Scotland’s Lucy Alexander 2nd), Sam Houston Park Texas (Joanna Walton), Casa Anfa Morocco (Serena Brotherton), Newbury (Page Fuller 2nd), Stockholm Sweden (pro Racheal Kneller), Dundight Netherlands (Jessica Gillam) and Pleasanton California (Rachael MacDonald). All of the year’s participants will be invited to the annual finale on 9th November in Abu Dhabi where winners from the year will also be invited to ride. Many thanks to Lara Sawaya, Executive Director of HH Sheikh Mansoor bin Zayed Al Nahyan Global Arabian Horse Flat Racing Festival and Chairman of Ladies Racing at the International Federation of Arabian Horse Racing Authorities (IFAHR) for these incredible opportunities for amateur lady jockeys to ride all over the world and experience diverse cultures and racecourses. The 5th race in the 8 race Betfair series was won today by Kaine Wood giving him his 3rd career win from only 8 rides this season. 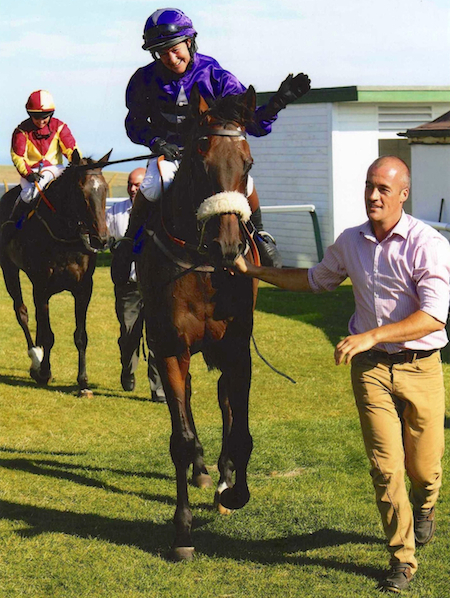 Riding DAN EMMETT for trainer John Wainwright, he held his horse up and made steady headway, tracking the leaders and kicking for home from 2 furlongs out to forge well clear of the field and score by 12 lengths! Many congratulations to Kaine and winning connections. The next race in this exciting series takes place at Nottingham on Friday evening. 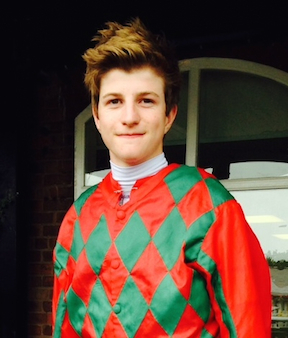 Many congratulations to Alex Ferguson who has surged into the lead in the Betfair Novice Amateur Riders Series with a second win in the series today at Royal Windsor, to add to his victory in the opening race of the series at Catterick Bridge. with riders on 1 point: Katherine Begley, Alexander French, Patraic Hardy, Katy Lyons, Katy Mabon, David Noonan, Ollie Pimlott, Harry Reed, Emma Todd, Charlotte Watling, Laura Wilson, John Willey, Michelle Bryant and Tabitha Worsley. 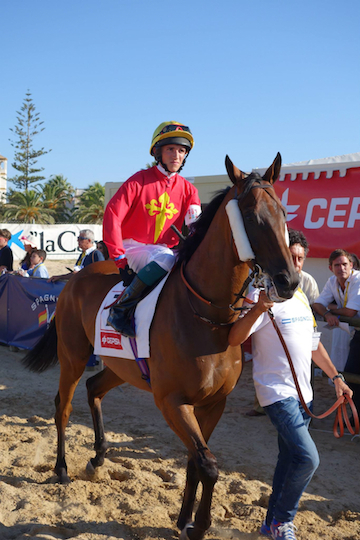 Well done to Freddy Tett, our British Fegentri representative, who rode on the beach in Sanlucar on Thursday and finished 3rd behind two Spanish jockeys before returning to the UK to ride in Jersey independently on Sunday. Freddy has clocked up several winners in the Channel Isles this summer both on the Flat and over hurdles when he has not been travelling. Congratulations Fred! Serena Brotherton can’t stop winning! With two wins in two days, yesterday at Brighton on regular ride CITY GROUND (pictured above) for owner Steve Hull and the Easterbys (who travelled nearly 300 miles from North Yorkshire) and today at Musselburgh with LA BACOUETTEUS for Iain Jardine, Serena Brotherton seems to be unstoppable in her quest for another Ladies Flat Championship. She now leads the ladies table with 8 winners, her nearest rival being Megan Nicholls with 4. The season is proving to be one of Serena’s best ever. Well done Serena!